In a tough jobs market, more South Korean college students are putting off graduation. One of the questions frequently asked by college students in South Korea these days is if putting off graduation is helpful to finding employment or not. It is common to see users of SpecUp, an online employment portal with about a million members, posting questions about the benefits of delaying their graduation. South Korean college students are able to ask their universities to postpone graduation once they finish their course or there are no more credits to take. Students can maintain their student status, but they are no longer required to attend school. The phenomenon was first introduced during the Asian economic crisis of 1997 in an attempt to reduce the number of jobless. Since then, it has become an increasingly common aspect of South Korean college life, with the number of students not leaving school rising every year. According to a report by South Korean lawmaker Ahn Min-seok, the number of students delaying their graduation increased from 8,270 in 2011 to 14,965 in 2013. 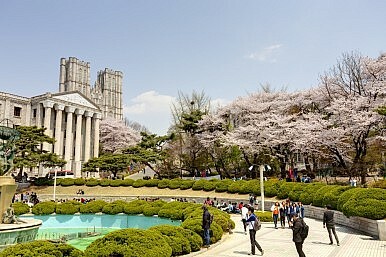 The report surveyed twenty-six South Korean universities with more than 10,000 students registered. The report noted that the number of colleges allowing students to put off graduation has been increased as well, to 33 this year. It added that 12,169 students had already delayed their graduation as of March this year, and the number was expected to grow. There are many reasons for this relatively new trend, but South Korea’s tough job market is the biggest factor. One of South Korea’s largest job search websites, Job Korea, surveyed 1,116 job seekers on March 19, and 53.2 percent of respondents said they have either already put back graduation or planned to do so. Of those respondents, 50.8 percent said that they had made the decision to acquire skills relevant to the company they want to work for in the future or to bolster their resumes with extracurricular activities. And 46.1 percent said they had put off graduation for fear of not getting a job, while 45. 3 percent answered that it was because they felt companies discriminated against graduates. “In order to use school facilities” and “there are more opportunities for people with student status” were also popular answers. “It is impossible for students to get a job right away after graduation these days due to the bad economy,” said 30-year-old office worker Jeong Sang-man, who also put his graduation back before getting a job. Jeong explained that those graduates who cannot find a job are considered to have “jobless” status, which could be a problem for future applications. Meanwhile, 77 percent of schools allowing students to put off graduation charge for the privilege. As of 2014, 12 universities were charging students from $100 to $270, Ahn’s report revealed. Another 12 colleges force students to take an extra class, even though there are no more credits to take, with a cost ranging from $300 to $700. “Some universities’ way of dealing with those students is unacceptable since it’s not only burdening them financially but also discouraging them,” Ahn said. “South Korea’s Ministry of Education should conduct a study and seek improvements immediately,” he added.